Whittlesea Secondary College considers the well-being of the students to be an essential part of their learning. The primary goal of our dedicated Student Well-being and Student Engagement Teams are to ensure students feel safe, engaged and connected at school. The teams are coordinated by the Leading Teachers Student Well-being. There is an Expectations Matrix which outlines appropriate behaviours and responsibilities for all students. The school uses a Positive Behaviours Program in all classes. Our school communities are a key part of our well-being and learning structure, which works towards ensuring that every student is known, supported and has positive experiences during their time at WSC. 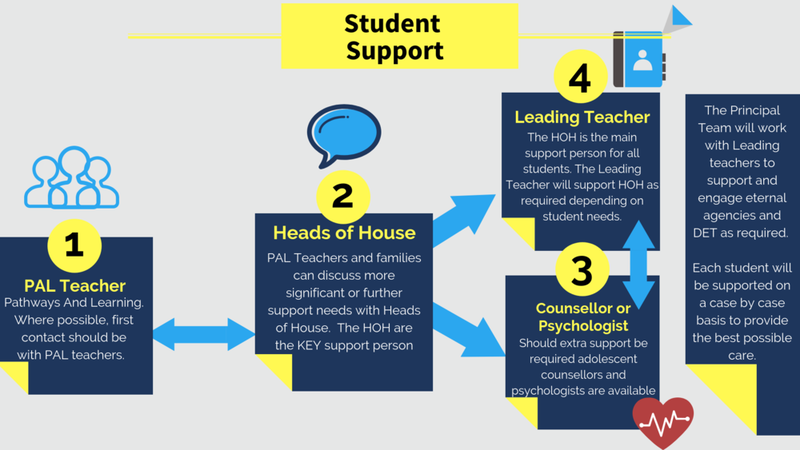 Each House community has a Leading Teacher who works with a team of Heads of Houses and Pathways and Learning (PAL) teachers, to provide community links, foster connectedness, and oversee learning and welfare for those students within each community. We have 2 communities and 8 houses, with each house having around 100 students made up of students from different ages. Students in each of their houses are split into 4 groups of around 25 students each, and meet for 70 minutes each week, supported by an adult mentor who will facilitate student led learning and care. Each student is in a House, these are the groups the students will be in for the duration of their journey here at the college. The Head of House is a teacher who oversees the well-being of all students in that House. By having a vertical House system students will have significantly improved relationships and supports from staff who know them personally and can support their individual needs.Students also learn the increasingly important skill of developing relationships with a broader group than just one class. Peer support through the House activities will continue to develop and grow as we encourage our young leaders to flourish. Parents and students should initially contact their PAL or Head of House with any concerns. In 2019, the school is introducing the Respectful Relationships program for all students. The program learning materials have been designed for teachers in primary and secondary schools to develop students’ social, emotional and positive relationship skills. Efforts to promote social and emotional skills in young people have been shown to improve health related outcomes and subjective well-being and reduce antisocial behaviours. The program will include Health Education and guest speakers such as the School Nurse and external agencies to ensure the best all round care and resources for our young people. If you hold a valid Concession Card/Health Care Card or are a temporary foster parent, you may be eligible for CSEF. The allowance is paid to WSC to use towards expenses relating to camps, excursions or sporting activities for the benefit of your child. From 2019 Whittlesea Secondary College will be engaging in the Berry Street Training and using this as part of our pedagogical model. We strongly believe in positive well-being as the foundation for positive engagement in learning. The Rock & Water program is an experience that provides young people and adults a pathway to self-awareness, and increased self-confidence and social functioning. Each participant of the Rock & Water program undergoes a journey of self-awareness as they learn about responding to life with either a "rock" or a "water" attitude. The use of symbolism is central to the success of the Rock & Water program and the reason why young people are drawn to the program. The program is an excellent tool to support young people in finding their grounding, learning how to centre oneself and learning how to self-manage in social settings. Topics covered in the program include: intuition, body language, mental strength, empathic feeling, positive feeling, positive thinking and positive visualising. Discussion topics include bullying, sexual harassment, homophobia, life goals, desires and following an inner compass. 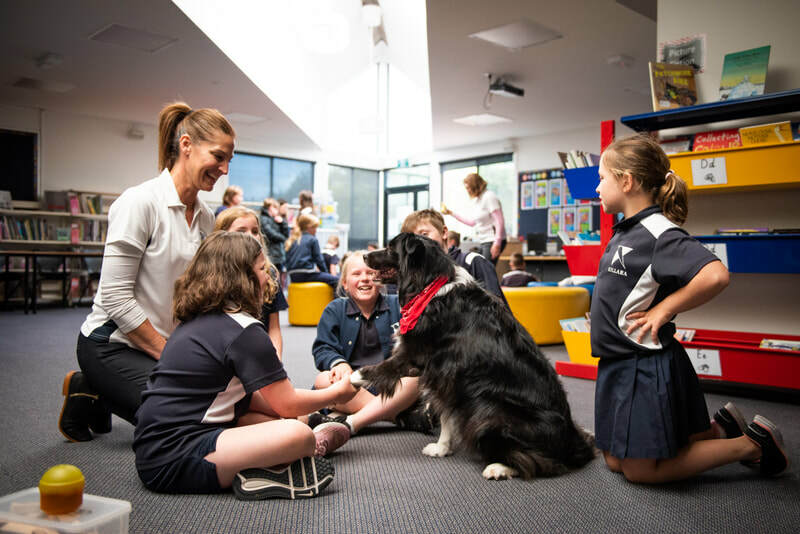 Canine Comprehension are a group of passionate and experienced allied health professionals, educators and dog trainers who share a vision of creating more harmonious, learning focused relationships between humans and dogs. Is about measurable results; see our long list of testimonials! need extra motivation and support. Chin Up Project is a unique organisation fulfilling service gaps for young people, engaging those that need it most in Secondary Schools, Primary Schools community organisations, youth justice, child protection and support services. We provide workshops, individual 'at school' mentoring and support, professional development for teachers, support workers, and carers. Our delivery celebrates the reality that each of us has a unique story. We see the value in mistakes and cherish the learnings. We recognise success and promote alternatives to negative patterns, the 'way things are', or 'always have been'. At the heart of Chin Up Project, our true point of difference are the incredible facilitators who tap into real-world lived experience and a deep well of empathy, guiding participants on a 'real deal' discovery of social learning and personal growth. Chin Up Project is a roadmap to navigate the journey into adulthood, where mistakes are cherished and experiential life lessons are a precious gift. About Raise: Raise Foundation is a registered Australian charity which provides mentoring programs for young people in high schools and in the community. Our mentoring programs provide a community of support around young people. Mentoring from a positive role model during the critical teenage years provides a nurturing pathway for young people to feel supported. Whittlesea Secondary has sucessfully run the In School Mentoring Program for a number of years with great success. Each year we identify new students to get involved. At WSC we use Restorative practice which seeks to repair relationships that have been damaged, including those damaged through bullying. It does this by bringing about a sense of remorse and restorative action on the part of the offender and forgiveness by the victim.